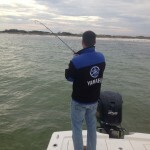 Pensacola Fishing Charters and Instruction at Redfish University- The place to be on the Gulf Coast!! With no slow-down at Redfish University in the foreseeable future, we’re just pounding out some really productive instructional and guided fishing trips here in Pensacola. The Winter of 2012-2013 has been absolutely astonishing with great fishing, beautiful weather(not tomorrow) and a tremendous volume of both travelling and local anglers visiting Redfish University for our expertise in instruction for redfish, speckled trout, bull redfish as well as locational and technique heavy services. 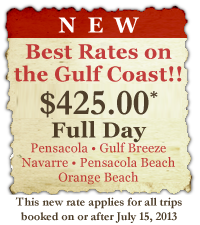 March and April are already halfway booked with many Winter clients looking for additional trips at Redfish University as well as a huge amount of Spring Break anglers travelling to Pensacola, Destin, Orange Beach, etc. 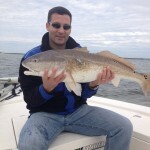 Thank you for choosing Redfish University as your inshore fishing guide service here on the Gulf Coast! Big year! 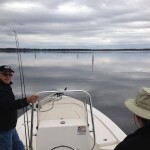 On Monday, we performed an instructional shallow water bull redfish trip in southern Pensacola Bay. 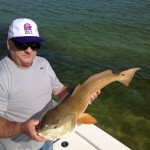 Many anglers find it elementary and even boring to chase huge schools of bull redfish in our bay. I would have to agree. 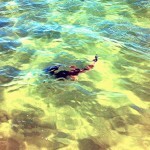 The sport of shallow water sight fishing for these fish is much more challenging, rewarding and entertaining. With overcast conditions, my job was made a bit more challenging as not all the huge redfish were in less than four feet water. 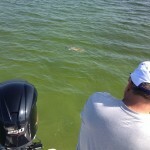 In fact, many were in over six feet of water which made them very difficult to mark and point out to our anglers. The big new shipment of Oakley Scalpels, especially in the VR28 lenses, gave us a clear advantage that morning. Lots of fish viewed, some would bite and some would not. Ended up with some beauties on the Berkley Gulp! 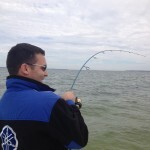 4″ Shrimp and really worked out Redfish University’s arsenal of new Penn Conquer 4000s and the new Penn Regiment rods. 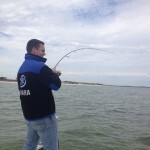 Even the new Abu Garcia Inshore Revos 30 Spinning got stretched out well. 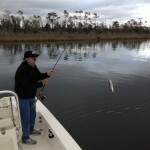 On Tuesday, it was back to the redfish and speckled trout instruction up north and mid-bay. 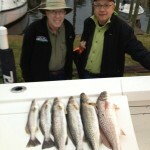 The speckled trout were rabid throughout the afternoon with our first speckled trout measuring 23.5″ and 22.5″ respectively. This is a nice way to start an instructional Redfish University although we may indeed be famous for starting with a bang. 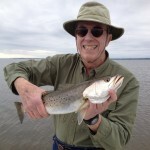 In fact, we actually had some trouble catching more speckled trout under 20″ for the next hour or so. Not a horrible problem!! 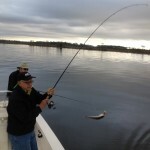 As the feverish bite slowed later on, naturally, we went to smaller baits and smaller fluoro to mop up trout after trout with some nice redfish mixed in. Smaller baits mean Berkley Gulp! 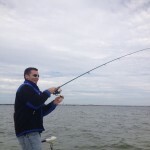 Flats Worms and 3″ Shrimp with 10-12# Berkley Pro-Spec Fluoro. Today we were met with some pretty thick fog early and overcast conditions which made it difficult to see but not impossible. 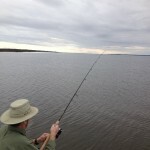 Some blindcasting into areas which big numbers of bull redfish produced for us and eventually the sun broke through and we were seeing and catching plenty. Weekdays are a bit more productive for sight fishing these large redfish on the flats with less boat traffic and pressure although we rarely see local anglers attempting this style of fishing.